Columbia, SC (August 24, 2016) – According to two new studies released today at the SC Aerospace Conference & Expo, South Carolina’s aerospace industry continues to drive economic growth. An economic impact study released by the South Carolina Council on Competitiveness shows that the impact of aerospace on South Carolina’s economy has grown to $19 billion, an increase of $2 billion since last measured in 2014. 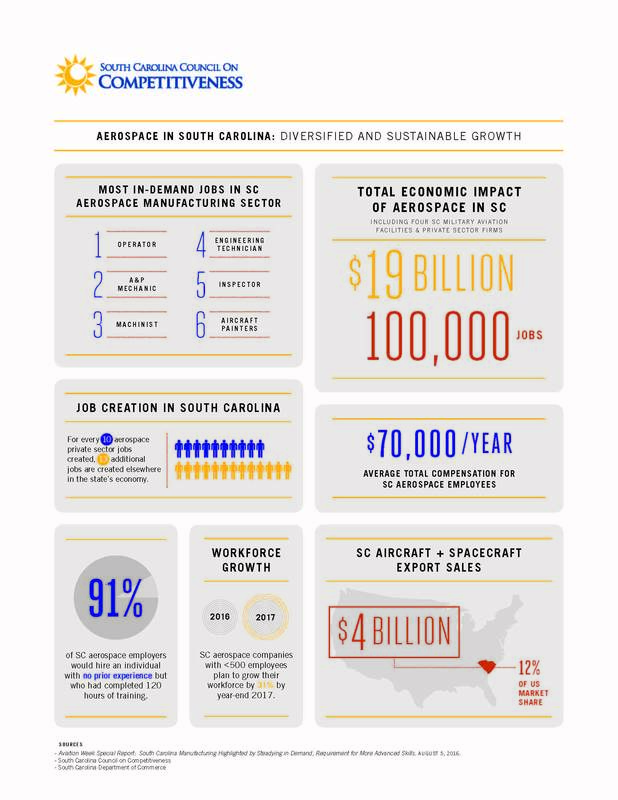 The Council’s study finds that for every 10 jobs that are created in the private sector component of the aerospace cluster in South Carolina, an additional 13 jobs are created elsewhere in the state’s economy. The average total compensation for private sector aerospace employees remained at $70,000 per year, and still far exceeds the state average of $41,338, and the manufacturing industry as a whole, which averages $53,350. “This year’s research shows a clear indication that the industry is diversifying and trending towards sustainable growth. We see that the majority of firms continue to be small businesses with fewer than 5 employees. We also see growth, not just in aircraft manufacturing, but also in engine manufacturing, instruments manufacturing and other types of firms,” said Dr. Joey Von Nessen, author of the Council’s report and research economist at the University of South Carolina’s Moore School of Business. The second study released at the conference, the 2016 Southeast Manufacturing Study, was conducted during May and June 2016. Alabama, Florida, Georgia, North Carolina and South Carolina participated. Aviation Week invited more than 300 companies to participate; 13 percent did so across five states. The purpose of the study was to better gauge the need for manufacturing workers in the Southeast, the region experiencing the highest rate of growth in terms of manufacturing operations in the United States. Respondents to the survey indicate steady increases in manufacturing jobs across the board. The six most in-demand job categories in South Carolina’s aerospace manufacturing sector (in descending order of demand) are: engineering technicians, aircraft painters, production technician, machinist, inspector and A&P mechanic. South Carolina’s employers indicate in the Aviation Week study that they will rely heavily upon the high school education system to prepare these workers, but companies stress that post-secondary education is desirable for the high-demand job categories. Ninety-one percent of respondents in South Carolina indicate they would consider hiring an individual with no prior aerospace experience but who completed aerospace-specific manufacturing training through a technical institute and resulting in certification. An industry “cluster” is a group of complementary businesses that focuses on or serves the same industry. They come together to increase efficiency and innovation within that industry, while boosting the overall economy in a region. Clusters attract more businesses to an area and provide more opportunities for existing businesses to grow. South Carolina’s aerospace cluster includes manufacturing, air transportation and air transportation support services firms operating in the private sector and the state’s four military aviation facilities. The SC Council on Competitiveness is a business-led, non-profit organization advancing the long-term economic competitiveness of our state, industries and citizens. Our work is accomplished through actionable economic research, support of industry clusters and education and workforce initiatives. For more information, visit www.sccompetes.org.